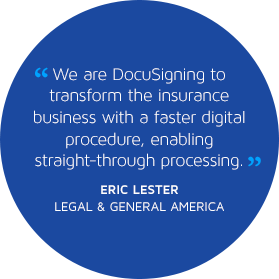 DocuSign powers 12 of the top 15 U.S. insurance companies and more than 1,400 Life and Property & Casualty agencies. 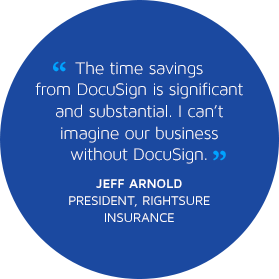 Endorsed by the Independent Insurance Agents & Brokers of America (The Big "I") and an integrated partner with Vertafore, DocuSign helps you streamline processes and improve your ability to serve your customers. DocuSign’s Digital Transaction Management solution helps Life and Property & Casualty carriers meet the needs of the modern consumer – anywhere, anytime. The DocuSign platform integrates seamlessly into existing business processes and systems, streamlining workflow and lowering costs, all while increasing compliance and reducing the time to complete key interactions with your customers. Agents are on the front line of the insurance business, and staying a step ahead of the competition is critical to an agent’s success. Whether your agency consists of just one agent or hundreds, DocuSign can give you the edge you need to compete for new business and serve your current customers with superior service.